Aisslinn Nosky (center) leads the Handel and Haydn Society orchestra in Mozart’s Violin Concerto in G Major during Friday&apos;s performance. Mozart was no stranger to public entertainments, and he could be a harsh critic. During his lifetime, he wrote two humorous and slightly crass canons namechecking the Prater — the new Vienna public park donated by Emperor Joseph II in 1766 — and all the amusements to be found there. 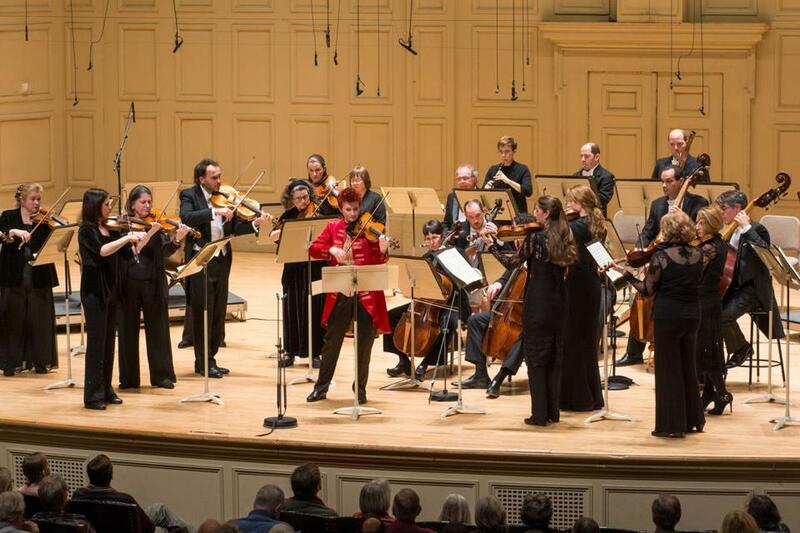 Honoring Mozart’s 261st birthday on Friday night at Symphony Hall, the Handel and Haydn Society put on a show that might have inspired a canon in its praise, had Mozart seen it. Watching concertmaster Aisslinn Nosky perform was akin to watching an expert circus artist climb, contort, fly through the air, and stick her landing. The sheer virtuosity, dexterity, and communication required for the violinist to lead Mozart’s Violin Concerto in G Major was evident in the score, but looking at Nosky, one would have thought she spent no effort steering the orchestra and conjuring colorful cadenzas, doing it all with a smile. Mozart composed the concerto when he was still a teenager, and it is saturated with youthful exuberance. Whether the moment called for nimble and flashy or long and lyrical, Nosky played with passion and immediacy, and the orchestra followed her example. She engaged the audience, trilling in the violin’s highest register and quirking her eyebrows, and shrugging when the piece ended with a simple oboe farewell instead of a violin flourish. Her new cherry red ringmaster’s coat was just icing on the cake. Handel and Haydn artistic director Harry Christophers conducted the other pieces on the program, all of which were by Mozart’s good friend Haydn. Nosky, Christophers, and Haydn are well matched in their ebullience and flair for musical jests — anything that shakes the listener’s ear out of autopilot. An arterial oboe line anchored the ambling Andante second movement of the evening’s opening, Symphony No. 26, “Lamentatione.” In the third movement, sudden accented chords made some people jump in their seats. Haydn’s still got some surprises left in him. The second half began with the Overture in D Major from a larger, lost work, and it’s a shame that work is lost if it had even half the excitement of its surviving fragment. Only a few minutes long, it took the orchestra on a madcap ride through hairpin turns in the strings and frisky accents in the brass. During the final work, Haydn’s capricious Symphony No. 86, the third movement minuet’s fiery start stood in delicious contrast to the statelier middle section. In the finale, there was no discrepancy in energy between sparse and soft passages and the roaring dashes that began and ended it, the orchestra maintaining a thrilling pulse throughout. In the circus ring and in the concert hall, it’s necessary to nail the technicalities, but equally so to engage and entertain the audience, and the Handel and Haydn Society did both. Zoë Madonna can be reached at zoe.madonna@globe.com. Follow her on Twitter @knitandlisten. Madonna’s work is supported by the Rubin Institute for Music Criticism, San Francisco Conservatory of Music, and Ann and Gordon Getty Foundation.